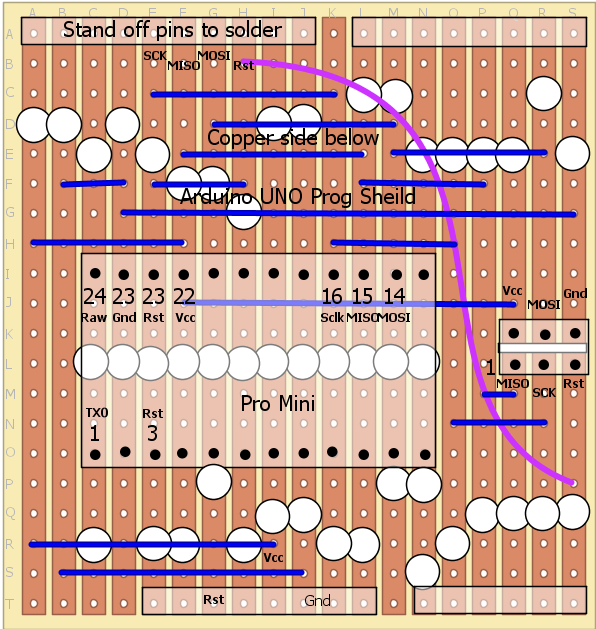 The layout for the UNO Pro-Mini shield is shown above. It isn't difficult to wire up if you just want to do a quick programming job but it isn't nearly as convenient as building it onto a shield. The white circles are cuts in the copper strip that can be made by hand with a 6mm drill bit. The blue lines are links made with 22 SWG tinned copper wire and the wiggly line is an insulated wire link. It has been recommended elsewhere to include an electrolytic capacitor between reset and ground. I included one on my board but the programmer didn't work at all so I removed it. You may find that some of the copper cuts on the layout aren't needed as a result of removing the capacitor. The shield has a socket for plugging in a Pro-Mini, an ISP connector for using like a standard ISP and 3 status LEDs. The ISP connector can be used to connect and program Arduino boards with onboard ISP connectors. The Pro-Mini board does not have an ISP connector but it can be plugged into the socket on the shield, programmed then returned to your target hardware. 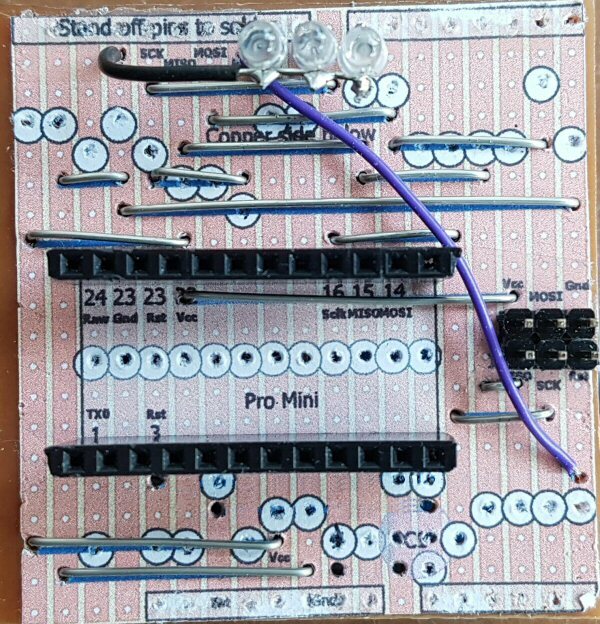 The above image is my finished ISP programmer shield. To load the ArduinoISP sketch into the UNO and program your Pro-Mini see the instructions on the Arduino As ISP example sketch page.